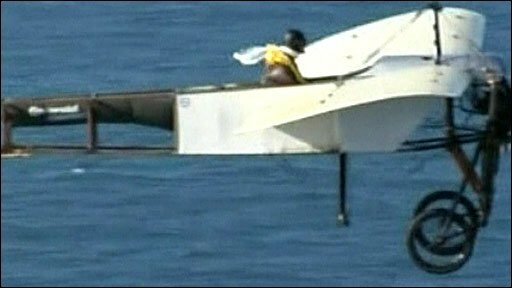 A French pilot has successfully recreated the first flight across the English Channel, on the 100th anniversary of the achievement. At dawn on 25 July 1909, Frenchman Louis Bleriot created history by piloting his Bleriot XI from Sangatte, France, to Dover in England. French pilot Edmond Salis took off from Bleriot Beach on Saturday in an exact replica of his monoplane. The crossing was part of the Dover 2009 celebrations marking the centenary. Mr Salis landed on a grass airstrip just before 0900 GMT at the Duke of York's Royal Military School, close to where Mr Bleriot crash-landed after his 36-minute flight, in the shadow of Dover Castle. His cloth and wood monoplane, which dates from 1934, is identical to the one Bleriot flew. High winds forced the cancellation of a flight planned for later on Saturday where Swedish pilot Mikael Carlson was hoping to lead three replica Bleriot XIs across the Channel. Mr Bleriot's grandson, who is also called Louis, watched the aeroplane land. He said: "Today is a great day the anniversary of my grandfather's cross-channel flight of course -so for me, it's something that I've been waiting for for ages of course. "Not only to France, but for the world, his cross-channel flight was really the beginning of modern aviation." 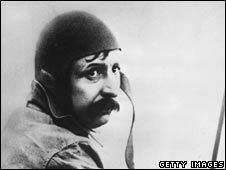 Mr Bleriot earned worldwide fame and a £1,000 cash prize, courtesy of the Daily Mail, for his 1909 achievement. His lightweight aircraft, with a 25 horsepower engine and made of ash, went into mass production. The enterprising Gordon Selfridge had the Bleriot XI taken and displayed in his new department store in London.